Whenever I meet friends, they would always tell me: "You are doing so much! How do you find time?" I usually give them this exasperated look and tell them: "I don't sleep!" But now, as I'm sitting in front of the computer while my son is sleeping soundly with my favorite Leaders Insolution sheet mask plastered on my face, I'm doing quite good! I'm actually enjoying this roller coaster ride called MOTHERHOOD! A little background about me to newbie readers. I'm a hands-on mom with a Day Job and multiple side jobs. My freelance jobs include --- Make Up Artistry, Make Up Training to Various Brands and AMW Workshop Series, a Brand/PR Consultant. Adding to that is my day job as a Consultant in an Executive Search firm. Now how hands-on am I as a Hands-on Mom? I spend more than 50% of my time with my son! If I work from home, jump it up to 80-90% of my time! I co-sleep with my son, bathe him everyday, cook for the family, play with him and teach him (if he's in the mood for learning) and I am also his favorite toy! --- yes guys, I'm an ANIMATED mom and I'm proud of it! And yes, I do all these in 24 hours, there are days I can't complete a task but most of the time, I sleep with a big, contented smile on my face. So if I can do it, you can definitely do it too fellow mommies! Today's post, I am sharing some of the Working Mom Tips I Live By. PLEASE SHARE YOURS on comment box below because I'd love to learn from you too! They key word that made me stay sane all throughout 3 years of motherhood! When I got pregnant, I knew my life will change! The things used to matter the most like traveling will not be top priority anymore! As a working mom, you have to give up something to free up some time for you and your family. As a professional Consultant for an Executive Search firm, that is my TOP priority because this is the job I've been doing for the past 10 years! As much as I love to squeeze in Blogging time in the middle of "work" day, I never do so because it will slow me down and I will probably end up not finishing ANY task at all! Key word is, focus and finish the job within the hours provided. No straying! to wear ONE HAT at a time (if you are like me who wears a lot!). Focus on ONE task at a time and finish one before you go to the next. Staying focus will cut off time at work! Let's say, when you are with your child/children, as much as you would like to answer emails or make phone calls, stop yourself from doing so and focus on spending time with them! In that way, even if you are spending only half an hour with them, it is a good half an hour spent with no time wasted! I'm sure your kids will appreciate that! Everybody's been calling me a "Superwoman" and I have to decline that title because I can't take full credit on that! The reason why I can look like a "Superwoman" is because I have my own "Justice League" (a.k.a. the AMW League!). I am so lucky to have a family who live close-by to help out whenever I need extra hands! I am even more blessed to have a husband who is willing to do more housework just to ease up the weight on my arms, back and hands! And I'm sure not everyone has the luxury of a family who live close by but that doesn't mean you can't ask for help! Seeking for help doesn't mean you are failing in your responsibility as a parent, instead, you are being responsible enough to do everything for the family! There are times I would request Mr. AMW to bathe Kyle instead because I just need the extra 30 minutes of ZZZ's. And if you wonder how I can move around going to events, set up meetings and do makeup trainings? I ask help from my mom-in-law who willingly look after Kyle whenever I'm out! It is the most comfortable feeling to know that your son is in good hands while you're away! With my multiple tasks, it is very easy to over commit yourself to projects that you think you can do just to "earn". It is by rule for me to learn to say "NO" when I know I can't give 101% attention to a task provided. .
What I usually do is to set realistic boundaries on my daily schedule and if I can't squeeze another project, I learn to say NO. 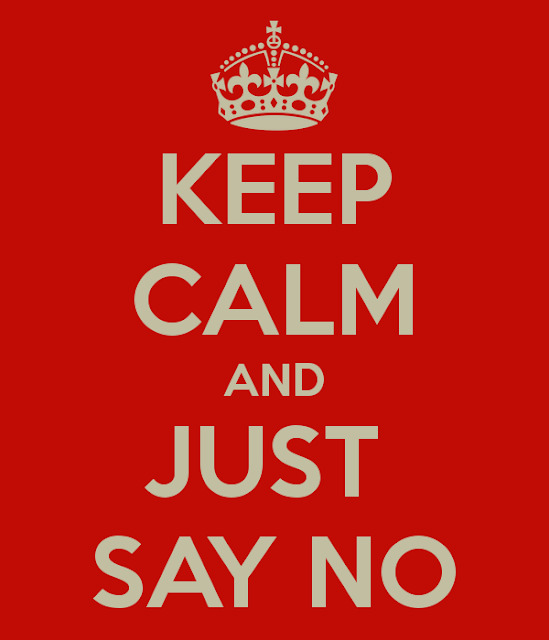 Saying NO earlier is better than wasting time for both you and your clients. I am very thankful that I get to meet a lot of people in my work. Because let's face it! Fellow moms out there can relate, there are so many times we'd rather sleep than remove makeup or even brush our teeth! There are so many moments we'd rather stay home than go to a salon. True to what Mr. AMW would always say, I have to take care of myself first before I can take care of others! Can you imagine how a client would book me if I don't wear makeup at all? How would brands hire me if I can't even make myself look presentable during meetings? Yes, just this small pouch that is almost the same length as my hand! Inside includes pretty basic items. 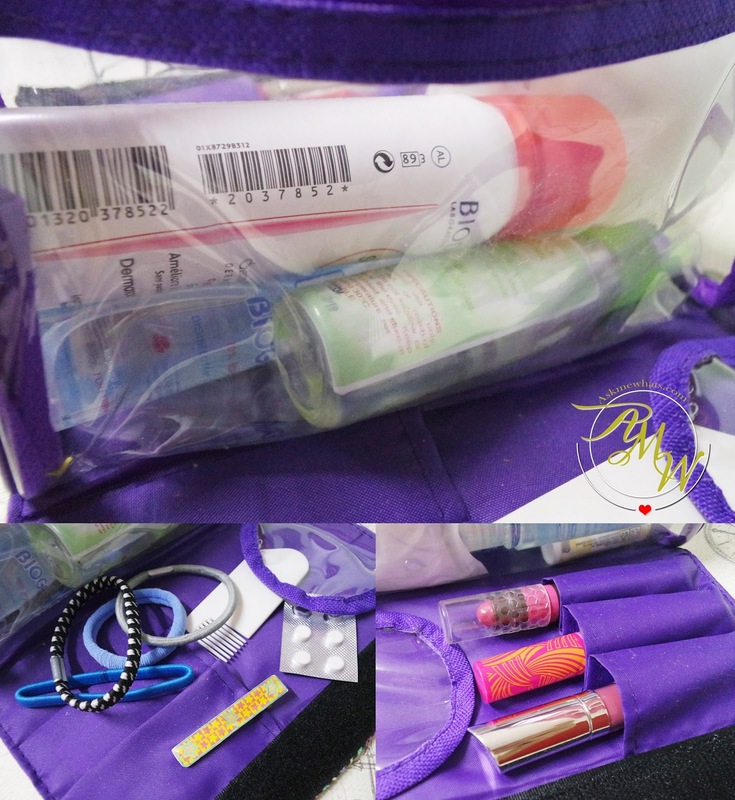 A comb (from hotel lol), Hair ties, Hair clip, 2 lipstick shades to choose from and a Cheek and Lip Tint, Anti-histamine because I do have allergy attacks every now and then. I also include a mouth wash because I usually eat and drink coffee between meetings and before going on to the next client, I would excuse myself to a washroom and use mouth wash. Nothing beats having good breathe when you talk to someone. I also have my ever trusty Biogenic Alcohol, I love that they came out with a small spritz bottle because I rely on them heavily before using the washroom! I also like to sanitize my hands before meeting new clients and I love how it smells great! I even have clients who asked me what "gel alcohol" I use because my hands smell good and imagine the surprise when I tell them it's from a regular alcohol! I also bring with me my Bioderma Sensibio Spray, this works so well when I start to have skin allergies and it helps soothe and relieve redness almost instantly. Fellow mommies, share to me your Care KIT! What are the contents? Seriously, there are times I find myself getting too uptight. But thankfully, I have a son who unknowingly reminds me to just be who I am, to feel child-like over again, and not over think instead, just enjoy every moment because he won't be this SMALL for long! Fellow mommies, do you have any other "Working Mom Tips" you may like to add?